How to Hack Pattern Lock Screen on Android Phones? Every Android user wants to protect their personal information from accidental deletion or ruin by someone else. That's why pattern lock screen or other lock screen mechanism is a crucial thing to do. However, what if you couldn't get into your locked device as you forget your device pattern lock? Recently, we have received a lot of queries from users on how to crack a pattern lock on an Android device. No matter whether you want to hack someone else's phone or your own phone pattern lock, there are lots of methods to bypass Android device pattern lock. Here, we are going to show you 5 different ways to hack pattern lock on an Android phone. Try out below-mentioned methods and see which works for you. The first and foremost method to hack the Android pattern lock is Tenorshare 4uKey for Android. It is one of the ultimate Android Unlockers by Tenorshare. No matter how your Android device gets locked, this reliable and powerful software can bypass your Android pattern lock with so ease in just a few minutes. With the help of this software, you can bypass any Android screen locks, which include pattern lock, pin lock, password, or fingerprints. You can unlock Android screen lock with one-click of a button. The software can remove any type of Android screen lock in a few minutes. It comes with a system detector that detects if your Android phone is ready to perform the next step of the process. It supports various Android devices, which include HTC, Samsung, LG, Google, and many more. 4uKey is compatible with the latest Android versions. 4uKey has a simple and user-friendly interface that does not require any technical skills. It supports every Windows version. It is compatible with every Android version. The software is extremely effective and efficient. It is 100% safe and secure way to unlock Android device lock screen. Step 1 Download and install the software from its official site on your computer. After its successful installation, run it and connect your Android device to the computer using a digital cable. Once the software detects your device, it will prompt you message for a successful connection. Step 2 After that, click on the "Remove" button to begin the unlock process on your device. This will download a suitable package to bypass pattern lock. Step 3 Now, click on the "Ok" button when you get a message. Within a few minutes, you will get access to your locked Android phone. That's how 4uKey software works to bypass Android pattern lock. It comes with a free trial version and so, you can give a try to the software. This is a video link on how to bypass Android lock screen with Tenorshare 4uKey for Android. Android Device Manager is certainly the second ultimate method you can use to crack pattern lock screen on an Android device. It is a feature that is present in all Android devices by default so that users can locate their device remotely in the case of missing or lost the device. You can use this service to unlock your Android device pattern lock as long as you are logged into the Google account. Fortunately, it is easy and simple to bypass your device pattern lock by taking assistance from this service. You can access this service on any device or computer. Step 1 To begin the process, access the Android Device Manager on your computer and then, log-in with Google account you are using on locked Android device. Step 2 After that, choose your device and next, select "Erase" option from the main interface. This will erase Android phone completely. The process is short and simple. It is the best way to unlock Android tablets and phones remotely. It might fail if the Android phone is not compatible. You can unlock Android screen lock with this method if your Android phone is switched off. Find My Mobile is one of the ultimate methods to crack a pattern lock if you are a Samsung user. 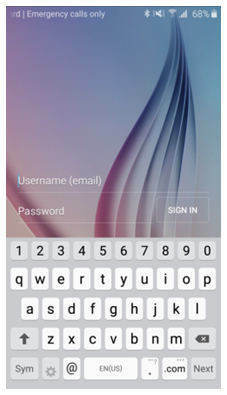 It is service provided by Samsung to users when they want to find their lost device or unlock their device in case of a forgotten password. Step 1 To commence the process, access the Find My Mobile service on your computer. Next, you need to log-in with your Samsung Account to begin the process. Step 2 Next, click on the "Unlock my Device" option from the left side-bar menu. After that, click on the "Unlock" button to execute pattern unlock on your phone. Step 3 After your Samsung device is unlocked, you will get a message on your device. It is great for Samsung users. This service works only for Samsung devices. It will not work if you have not set up a Samsung account. If you are having an Android device running with 4.4 or older version, then you can use Forgot Pattern feature to bypass pattern lock on Android device. It is the best method for those who are looking for a way on how to hack the Android pattern lock without any software. Step 1 To begin the process, enter the wrong pattern on your phone to get the "Forgot Pattern" option as shown in below figure. After you got the option, then click on it. Step 2 After that, choose the option to bypass your phone pattern lock with your Google account. Here, you need to enter your Google credentials that are linked to your locked device. Step 3 Next, Google will send you an email to unlock pattern or you will be able to reset your pattern lock right away. Step 1 To commence the process, enter your device in Recovery Mode. You can do this by pressing Power, Volume up and Home button together. Step 2 Next, choose "Wipe data/factory reset" option using volume down and up key. Step 3 After that, you need to confirm that you are sure to perform a factory reset on your device. Reboot your device once the process is completed and you will be able to access your locked Android device. That's all on how to hack Android pattern lock with and without software. If you want to get access to someone else's Android phone, then Tenroshare 4uKey - Android Password Unlocker is the ultimate way you can use. Plus, it is very effective Android Unlocker that can bypass any type of screen lock and work on every Android device.